These aren't like the rock solid plastic ones. They are more defo like a more dense rubber. You clearly stated "more like dense rubber." I did a quick search this morning. Most manufacturers of poly bushes do not specify any material hardness. I only found one that did but that company neglected to state which Shore hardness scale was used so no wiser. I suspect the reason these companies do not specify material hardness is they cannot achieve a consistent mix. BobLuxuryYaught says "I had these in my porsche 911 what what what"
How do you know they are not softer than OEM bushes? One way to find out is to measure them and compare. I still have the old OEM rubber front sway bar bushes from 2002 somewhere so will measure them and publish their Shore hardness. By the way, there was no visible wear on my old bushes. I did replace them anyway since I had removed the old and it seemed silly to put the old back on because new OEM bushes only cost a pound or two each. The OEM ones were much more pliable and malleable than the poly ones. But I have handled other poly bushes before and they are v rigid. Most companies don't say the shore hardness for 2 reasons. It means nothing to the average modder and it's one more piece of info that can be used to copy the original. The polyurethane can be mixed to very precise shore hardness and it's very easy to find out with a shore hardness meter. I got one designed to test tyre tread hardness but it does standard shore too. Most poly bushes are 80 to 90 shore. These bushes may wear out in which case renewal is the only cure. Given that bush thickness is no more than five millimetres, could someone please explain why a poly bush will make such a difference. A swaybar movement difference at bush of a few tenth of a millimeter surely cannot be felt by driver. the material is more dense (denser?) so the feel is firmer the more dense the material as they give less. yes clearly the harder the more "harsh" the ride can be but there is always a middle ground. the OEM rubber can be very forgiving but can also degrade and thus add play into the system. 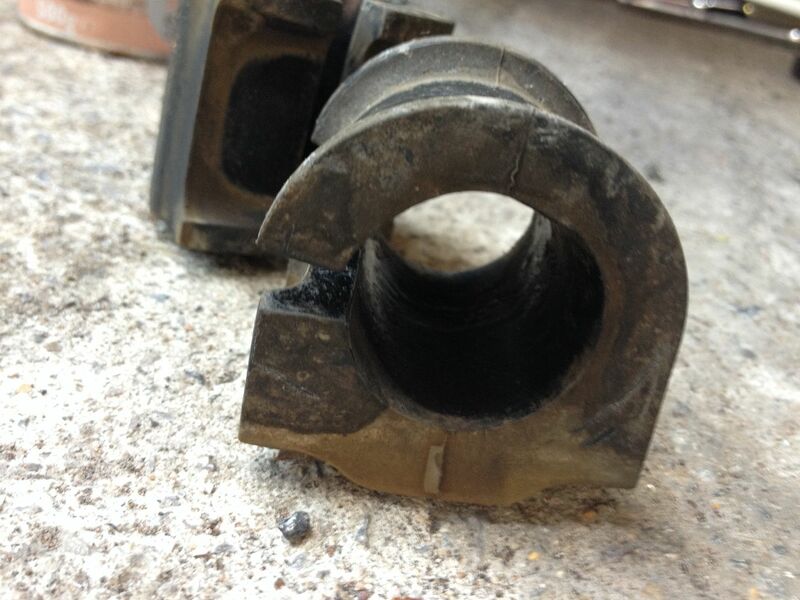 How many episodes of wheeler dealers do they reaplace worn suspension bushes. The fact is polyurethane bushes are simple and cheap to make so high profit for back street manufacturers. Bought for an arm and a leg by gullible car owners that believe these bushes will improve handling.